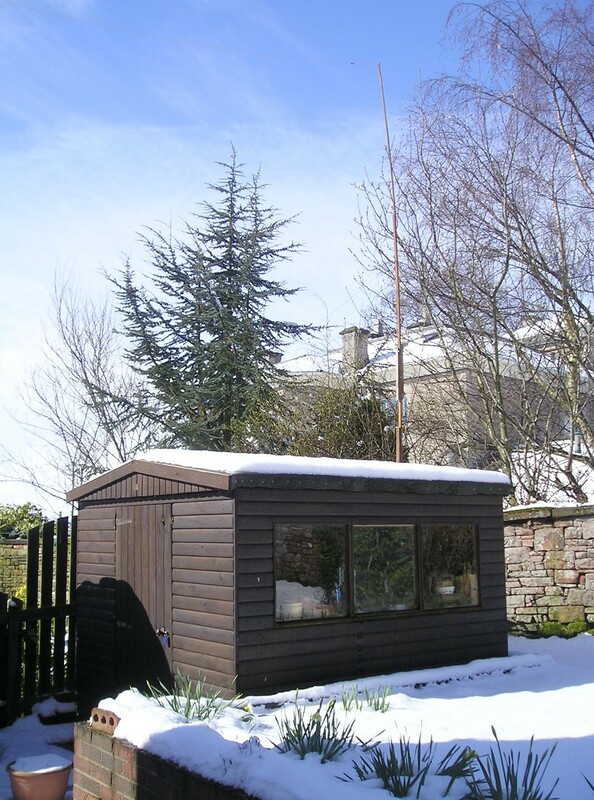 For the time being, here is a photo of my garden radio shack where there is always the smell of petrol and/or creosote! Click on the image for a closer view ... and yes, they probably are cobwebs in the window! 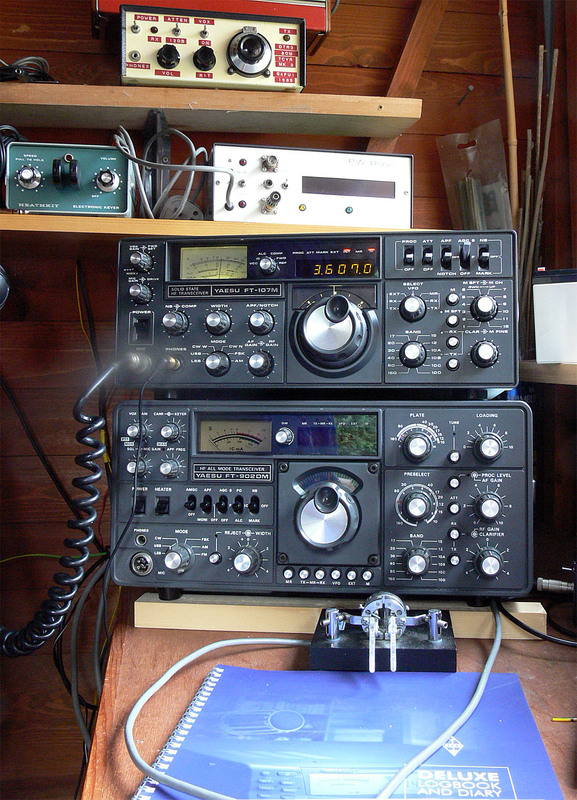 The rigs on the bench are my Yaesu FT-102 (bottom) which is undergoing restoration, and on top my Icom IC-751A which appears to be set to an SSB frequency and mode, most unusually for me! The Icom is fitted with the optional internal mains PSU. Antenna is an end-fed inverted 'L' and the MFJ-949C ATU in the picture is preferred over any "pi" tuners I have, including homebrew ones as it is basically a 'T' match, which I have found better for the bizarre impedances sometimes presented by end-fed antennae. I also have an S.E.M. Transmatch with the "EZ Tune" noise bridge, that is probably the best of all for my antenna system! On top of the MFJ tuner is a home-made dual meter reflectometer built from a circuit in an old ARRL handbook (it is a very standard circuit) and uses some old ex-broadcast TX Ernest Turner meters and an Eddystone box I just happened to have kicking around. Works a treat! On the top shelf is a home made 6m transverter waiting to be fixed (I think a tantalum cap has gone short circuit on it somewhere), my home built 80m CW QRP transceiver whose VFO at the third attempt is just about good enough for service on the bands, and an old Roberts transistor radio, made when AM medium wave receivers sounded decent! The Roberts is occasionally used for listening to football matches on Radio Five Live, unfortunately the Optimod processed audio as used by the broadcaster render the fidelity of the Roberts virtually useless, except that you can hear the distortion with great fidelity ... Still it keeps the wax from sticking to your ears! In the middle is a Heathkit HD-1410 keyer, which is the first and only Heath kit I ever built (around 30 years ago), and apart from being modified to accept an external paddle with left-handed right-handed switching has given unbroken service since then. I try to be "ambidextrous" with my Bencher BY-1 paddle, when operating left-handed I swap over the contact arrangements retaining the dots on the thumb side, and dashes on the finger side. I'm still pretty "QSD" in left-handed mode, but I am working on it! When operating "straight-key" I use a Junkers key, but strictly right-handed! 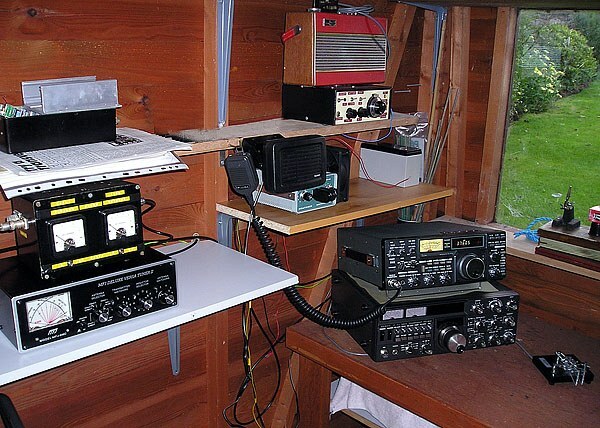 I have recently become quite fascinated in digital modes, and have become a big fan of the DM-780 program, part of the "Ham Radio Deluxe" suite. The most recent version of this program now has SSTV capability, you can view the most recently decoded SSTV pictures I have received here. I cannot recommend this FREE program highly enough! The picture on the left shows my FT-107M on top of my FT-902DM - the radios are from roughly the same era, note the strong family resemblance. The '902 is of course a hybrid solid-state / tube rig, whilst the '107 has no tubes. They are both solid performers with few vices. Click the thumbnail on the left for a look at how my station was around 1987 when I was at my most active.